November at CENFACS is the month of education and training; which revolve around the development of skills for life, for work, for poverty relief and sustainable development. It is the month during which we look into ourselves and try to assess, explore and learn the skills we need in order to help further reduce poverty in a sustainable way amongst ourselves and re-engage with the business of sustainable development. It is also the training implementation month during which educationally related projects or projects that involve training, skills development and acquisition of new knowledge to help users and our Africa-based Sister Organisations to empower themselves with the educational tools and training resources they need to further help reduce poverty. We all know that poverty is not only material or the lack of monetary income; it is even more the lack of knowledge, skills, know how and technologies than anything else. Therefore, knowing and learning a skill can help to further reduce poverty and set one on the right course of the development process. We strive to support those who want to learn a skill while we at CENFACS as an organisation plan our own training, learning and development programme from time to time when we can access both funding and training. The November 2018 focus on us will be on enhancing digital and media skills as well as capacity to continue to reform CENFACS and adapt it to the Media and Digital Developments. In doing so, we hope this can help us to meet new and emerging needs of our beneficiaries as well as the challenges of the business of poverty relief and sustainable development. The last three weeks of our A la une campaign have been dominated by the marine sustainability or water sustainability. In particular, we successively campaigned for marine biodiversity, marine technology and the reduction of marine pollution. This week, our A la une campaign has entered its fifth phase in which we are dealing with the burning issue of the Prevention of the Extinction of Endangered and Threatened Species. Further information about this themed area of work on Preventing Species Extinctions has been given under the Main Developments section of this post. The next issue of our Autumn ICDP (Individual Capacity Development Programme) resource, known as Festive Income Boost and which is designed to support Multi-dimensionally Income Poor Children, Young People and Families (MIPCYPFs), will focus on various ways of generating income. This year our focus will be on some of the casual jobs that poor people and families may undertake to make ends meet around the festive period. More information about this year’s edition of Festive Income Booster has been provided under the Main Developments section of this post. Besides the above selected initiatives for your readership and engagement, we have added for this week the following. Like any organisation running a shop over the Season’s special occasions, CENFACS needs GOODS DONATIONS and SHOPPING at its e-store over the festive time. We would very much appreciate if supporters could help either by providing GOODS as DONATIONS or SHOPPING at CENFACS e-Store or both. This way of supporting can further help reduce poverty over the Festive season and beyond. We will be providing further information about Festive GOODS DONATIONS and SHOPPING on our Charity e-Store page of this website. Thank you to those who wish to support our e-store! ~ Another extra message: we would like to inform you that our other on-going programmes, campaigns and projects scheduled for this Autumn are still running. speaking and acting with our Africa’s Sister Organisations to help in our own way protect both the endangered and threatened species in Africa; and working in line and alliance with other endangered species projects. One of the international species protection projects is CITES (Convention on International Trade in Endangered Species of Wild Fauna and Flora). We are looking at for example the outcomes of its last October Conference in London and how these outcomes can contribute to what we are campaigning for; in particular, the Declaration from London Conference on the Illegal Wildlife Trade. As said above, this week we are campaigning for the prevention of extinction of endangered and threatened species. We are against the extinction of endangered and threatened animals (such as elephants, penguins, lions, leopards, cheetah, black rhinoceros, pygmy hippopotamus, mountain gorilla etc. ); of endangered trees, plants and flowers; of endangered fishes and so on. We are against crimes from illegal trade in wildlife that threaten species’ survival. We are in favour for the closing down of markets for illegally traded wildlife. Likewise, we would like to see the impacts of illegal trade in wildlife been sensibly reduced for the rights of flora and fauna species. Furthermore, this week is about the review and re-launching of other campaigns on this matter, like Save the BIG CATS, the Elephant and Gorilla campaigns. Save the BIG CATS, the Elephant and the Gorilla campaigns are part the Prevention of the Extinction of Endangered and Threatened Animal Species. Finally, our motto for this week and this fifth phase of A la une campaign is: Save the Living Species (SLS). To support and or engage with this themed area of A la une campaign, contact CENFACS. The next issue of Autumn Individual Capacity Development Programme (ICDP) resource (Festive Income Boost) will be on Festive Work as the Season’s theme. Indeed, some income poor families can find more convenient to use traditional means of generating a little extra income. Others may be forced by the events or may try to grab the opportunity of the festive season to seek for temporary or the festive season’s jobs to generate a little extra income to meet the end of year bills. In fact, just before, during and just after the festive season, many businesses need help to cope with the pressure of the Season’s demand for goods and services. This is the same for MIPCYPFs who need income to meet their basic life-sustaining needs over the festive period. This is a particular time of the year when their respective needs can intersect, businesses’ needs of labour and poor families’ supply of labour can meet. Businesses need extra people to hire while poor families need extra income to cover the financial pressure of the Season. And if businesses can offer them casual jobs to make the little extra income, this could be good to reduce their financial pressure. 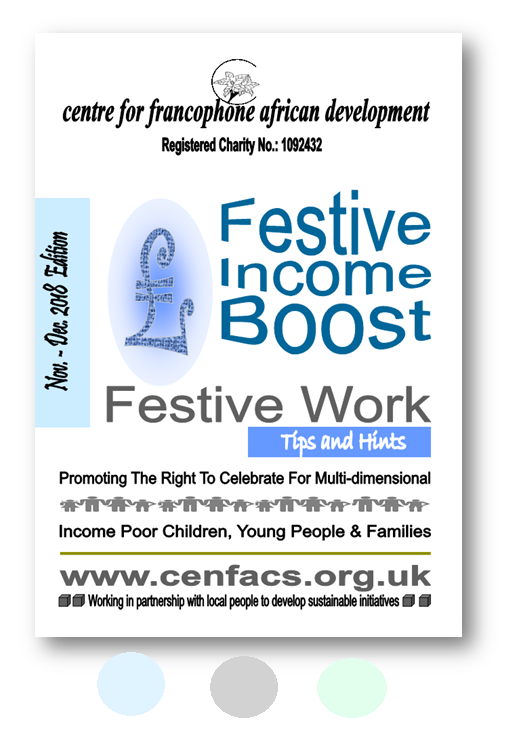 The Festive Income Booster is CENFACS’ Autumn ICDP and poverty-relieving resource that provides some income generation leads and tips. As the focus for this year’s edition is on Festive Work, the resource will include the following: temporary festive jobs, end of year earning opportunities, seasonal self-employment, petit jobs as some may call it etc. Festive Income Boost is for Multi-dimensionally Income Poor Children, Young People and Families (MIPCYPFs) and it is designed to support to them throughout the entire the festive season. The resource covers some ways of dealing with casual job interview questions, seasonal job search techniques (for both online and print searches), job search engines and leads, guidance on job applications and CV, reference building techniques, job ads, credit history or score, diary of job fairs and events, job matching to person specification and profile etc. It goes further in exploring steps that poor families can take to upskill themselves. The resource also covers security and protection matters when trying to generate a little extra income to make ends meet. In this respect, it tells again the new general data protection regulations, child protection and safeguarding issues for jobs where these requirements apply. The resource will be available as a booklet from CENFACS e-Store. It is normally free of charge but we will appreciate a donation of £5 to help us help reduce poverty and the cost of renewing and producing this resource.